WesleyLife was looking for an effective way to manage all of their email signatures so they had consistent branding and legal disclaimers, while ensuring that employees would no longer create their own versions. Exclaimer Signature Manager Exchange Edition gave IT centralized control of all email signatures. In addition, Outlook Photos was deployed to give signatures an extra level of professionalism. Providing healthcare to more than 10,000 adults in seven retirement communities and 11 counties across Iowa means that WesleyLife plays an important role for the aging population of the state. As the organization has grown over the years, it has taken considerable discipline to ensure that its corporate identity has remained consistent as new locations have opened and more employees have been recruited. With the sheer number of emails sent out by the organization every day, an internal audit showed that many employees had been designing their own email signatures, which was damaging brand unity. In addition, as WesleyLife is a healthcare organization, it has to comply with various legislations such as the Health Insurance Portability and Accountability Act (HIPAA), which requires legal disclaimers on all emails to protect the privacy of patients/clients and to avoid confidentiality breaches. With employees creating signatures themselves, legal disclaimers were often not added and key information would be missing. It was clear that a solution was needed to create a consistent and well-branded email signature that would automatically be added for all employees. It will save us (IT) a huge amount of time as we can now manage the signature process while allowing us to have consistency across the organization from a branding perspective. Exclaimer Signature Manager Exchange Edition adds signatures to all email that’s processed by an Exchange server, which means that it is impossible for users to change or remove a signature. This meant that the software would solve all of WesleyLife’s issues and all employees were given a standardized corporate email signature within an hour of the installation. Brand and legal compliance was now assured. 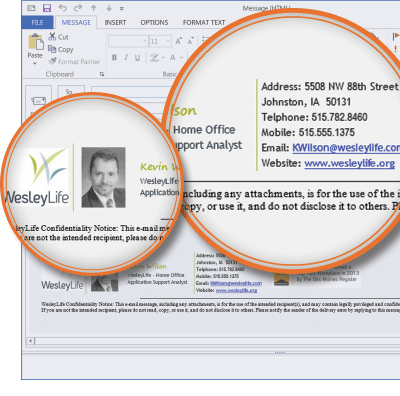 Once Signature Manager Exchange Edition had been set up, WesleyLife also downloaded Outlook Photos, Exclaimer’s free software solution for adding photos to the Outlook People Pane, a SharePoint profile and on Microsoft Lync. This was an added bonus in Mr Wilson’s eyes as it now meant that signatures could have professional photos added, with employees given a choice as to whether they wanted one or not. With all of the software installed and running successfully, the IT department were able to ensure its brand was not compromised through poorly designed email signatures. What would have been a very difficult process to manage internally became incredibly simple in its implementation and execution. The IT department did not have to go to each individual user’s PC to get them to update their signature manually and there was no need to even inform them of the changes. There have already been discussions about potentially using email signatures to highlight events being run by WesleyLife and the added integration of Outlook Photos has given the marketing department a number of exciting ideas for the future.